Most neurologists will know about the Brown-Séquard syndrome, comprising an ipsilateral paresis and proprioception disorder with contralateral pain and temperature disturbances, resulting from hemisection of the spinal cord. Charles-Edouard Brown-Séquard wrote his first publication on this finding between 1846 and 1849, starting at age 29. Born 200 years ago and raised on the isle of Mauritius, he moved to Paris in 1838 to study medicine. He worked at the private laboratory of physiologist Martin-Magron. This experience influenced him for the rest of his life. Possibly because of his republican ideas, he left France after the coup d’état of 1851 by Louis Bonaparte, the later emperor Napoleon III. He went to Philadelphia with a letter of recommendation written by Paul Broca. Later, Brown-Séquard worked in London, becoming one of the first physicians at the National Hospital for the Paralyzed and Epileptic. He was considered an expert in epilepsy.1 From 1864-1866 (with interruptions), he was professor at Harvard University. He founded several journals, including Journal de la Physiologie (1858, Paris) and Archives de Physiologie normale et pathologique (in 1868 with Charcot and Vulpian). In 1878, he succeeded Claude Bernard as the chair of physiology at the Collège de France in Paris. This brought more rest to someone who is said to have traveled the ocean 60 times. He worked and lectured at many places, in particular France, England, and the United States, but also on Mauritius. This restless traveling had several reasons, among which his birth at Mauritius, that was French originally, but became English following the defeat of Napoleon. His father (Brown), whom he never met, was a sea captain from Philadelphia and died before his birth. Charles-Edouard added his mother’s name early in his career. Although a physician, his heart was always in the physiology laboratory, and he was always looking for such an appointment. 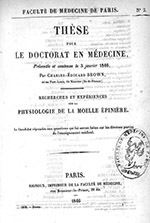 His 1846 thesis Recherches et expériences sur la physiologie de la moelle épinière described the fact that section of the posterior columns did not lead to loss of sensation, concluding that other parts of the spinal cord should contribute to the conduction of sensory impressions. In 1849, he found that hemisection of the spinal cord did not result in ipsilateral sensory loss. This is in contrast to earlier findings,2 but in contralateral hypalgesia.3,4 Although he worked on the spinal cord mainly between 1846-1855, he would return to the subject later. He worked on numerous other subjects, including rigor mortis and the action of the vasomotor nerves, in which he competed for priority with his predecessor at the Collège de France (Paris), Claude Bernard. Experimental observations that eventually elucidated the mechanism and function of the vasomotor nerves were carried out in the 1850s. In November 1852, Bernard found that section of the cervical sympathetic led to increased blood flow, rise in facial temperature and miosis, the latter phenomenon, which he attributed to the discovery, more than a century earlier, by his compatriot Pourfour du Petit (1727). However, in contrast to Brown-Séquard, Bernard did not understand the observed phenomena as, in his understanding, the sympathetic was considered the producer of the animal warmth. Therefore, he expected the contrary, notably cooling of the face and was quite surprised. In August 1852, Brown-Séquard published the results of his animal experiments during his stay in Philadelphia. He had galvanized (probably he meant faradized, using an induction coil invented by Emil Du Bois-Reymond) the cervical sympathetic of several animals and noticed constriction of the blood vessels in the ear and diminished temperature of the facial skin. Brown-Séquard’s physiological and clinical work on epilepsy led him to be considered an expert in the field. His spinal cord experiments in the early 1850s resulted in observations that he interpreted as epileptiform convulsions originating in the spinal cord. His observation of convulsions in guinea pigs following spinal cord sections, and that their offspring showed the same phenomena, led to his idea of artificially induced hereditary epilepsy. The ideas were used by Charles Darwin, who referenced him in several of his publications. Brown-Séquard realized it was not the same type of epilepsy as in human beings.6 It was later suggested that the animals were suffering from lice on the paralyzed parts. As for the clinical observation, it is important to realize that the brain was considered not irritable at the time (up to the famous 1870 experiments by Fritsch and Hitzig in Berlin). In Brown-Séquard’s concept, a reflex mechanism from the periphery conducted by nerves to the central nervous system was considered essential. Following Broca’s proof of cerebral localization of aphasia/aphemia in 1861, Brown-Séquard, although being a founding member of Broca’s Société d’Anthropologie, where the aphasia case was presented, made many observations that were not in agreement with the localization concept. He objected to the theory of circumscribed localization of functions in the brain, which prevailed at the time. He even warned against the use of the theory in brain surgery, which was emerging.7 He believed that many of his observations in humans and experimental animals could not be explained by the current of localization. His own notion of localization was dynamic and based on the principles of distant action (action à distance), involving inhibition and excitation. (He called it dynamogénie. He probably coined the term dynamogénie, development of energy or power, in 1879, although he had come across the phenomenon itself when he performed his experiments on the spinal cord in 1840.) Irritation in one location of the nervous system may be transmitted to another part where it may change its function dynamically. He presented this theory of “réseau de cellules anastomosées”(network of anastomized cells) in 1875 to the Société de Biologie. Cells serving the same function were supposed to be interconnected. Nerve cells endowed with any of the cerebral functions, instead of forming a cluster as is supposed, are disseminated through the whole encephalon, so that considerable alterations or destructive lesions can exist in one of the cerebral hemispheres, or in both, without the loss of voluntary movements of sensibility, or of any other brain function. Brown-Séquard defended his theories several times in papers and during meetings, including those at the Société de Biologie in the 1870s, where he debated with Charcot. With this model, he was able to explain the fact that damage in several locations of the central nervous system may produce the same effect, and to account for observations that some functions remain unimpaired despite extensive brain injury.8 Based on these localization theories and new experimental findings, Brown-Séquard even withdrew the theory of crossed sensory action of the spinal cord in 1894,9 although he admitted that it remained valuable with respect to the clinical syndrome. In the last phase of his career, Brown-Séquard studied the effects of (animal) testicular extracts. It was not the first time he subjected himself to experimentation. He injected the extracts, hoping it would have a rejuvenating effect. Noticing positive effects, he started the production of the drug in cooperation with his assistant Jacques-Arsène d’Arsonval. They offered extracts to colleagues, without charge, in order to let them try it on elderly patients. Brown-Séquard’s first presentation on the subject was before the Société de Biologie de Paris in 1889. Two years later, George Murray presented his ideas on the treatment of myxoedema with thyroid extracts from a sheep at a meeting in England.13 Probably as a consequence of Brown-Séquard’s claims, he was ridiculed, by a senior colleague who suggested this would be like treating locomotor ataxia with an emulsion of spinal cord. Although Brown-Séquard had serious intentions with his studies on this subject, introducing organotherapy in 1893, public reception was unfavorable, which harmed his reputation. Nevertheless, his contribution to endocrinology was acknowledged by several scientists, including the Swiss surgeon Theodor Kocher, who referred to him in his Nobel Award lecture of 1909. 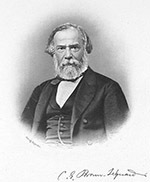 Brown-Séquard is still considered the father of endocrinology. As events in science and medicine are often reflected in literature, Brown-Séquard may be recognized in the 20th volume of the Rougon-Macquart novel series by Emile Zola, Le Docteur Pascal. It is about the country physician Pascal Rougon, who made a genealogical tree of his own family with the purpose of studying heredity. He noted interesting details about his family members, proving that degenerative traits are inherited. 1 Koehler PJ. Brown-Séquard’s spinal epilepsy. Med Hist. 1994;38:189-203. 2 Koehler PJ, Endtz LJ. Between Magendie and Brown-Séquard: Isaäc van Deen’s spinal hemisections. Neurology. 1989;39:446-8. 4 Koehler PJ, Endtz LJ. The Brown-Séquard syndrome. True or false? Arch Neurol. 1986;43:921-4. 5 Koehler PJ. Brown-Séquard’s comment on Du Bois-Reymond’s “hemikrania sympathicotonica”. Cephalalgia. 1995;15:370-2. 6 Koehler PJ. Brown-Séquard’s spinal epilepsy.Med Hist 1994; 38:189–203. 8 Koehler PJ. Brown-Séquard and cerebral localization as illustrated by his ideas on aphasia J Hist Neurosci 1996;5:26–33. 11 Stam CJ, Reijneveld JC. Graph theoretical analysis of complex networks in the brain. Nonlinear Biomed Phys 2007;1:3. 12 Koehler PJ. Book review essay: An improbable genius? On Michael J Aminoff’s Brown-Séquard: An improbably genius who transformed medicine. Brain 2011;134:1864-7. 13 Welbourn RB. The emergence of endocrinology. Gesnerus. 1992;49 Pt 2:137-50. 14 Koehler PJ. Charcot, la Salpêtrière, and hysteria as represented in European literature. Prog Brain Res. 2013;206:93-122. 15 Koehler PJ. About medicine and the arts. Charcot and French literature at the fin-de siècle. J. Hist. Neurosci. 2001;10: 27–40. Peter J. Koehler is the editor of this history column. He is a neurologist at Zuyderland Medical Centre in Heerlen, The Netherlands. He is also co-editor of the Journal of the History of the Neurosciences. Visit his website at www.neurohistory.nl. 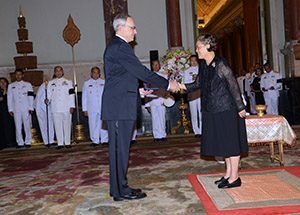 Vladimir Hachinski, MD, receives the Prince Mahidol Award at the Grand Palace from Princess Maha Chakri Sirindhorn of Thailand. Also in attendance were Prime Minister Prayut Chan-ocha and Canada’s Ambassador to Thailand Donica Pottie. He received the award from Princess Maha Chakri Sirindhorn of Thailand. Also in attendance were Prime Minister Prayut Chan-ocha and Donica Pottie, Canada’s ambassador to Thailand. The Prince Mahidol Awards are considered the Nobel Prize of Asia, primarily because a number of awardees have gone on to receive the Nobel Prize in Medicine and Physiology from Sweden. One of the prime missions of the Journal of the Neurological Sciences is to highlight activities of the World Federation of Neurology (WFN). Along those lines, I wish to remind everyone that the XXIII World Congress of Neurology (WCN) will be held Sept. 16-21, 2017, in Kyoto, Japan. The Congress will be co-hosted by the Japanese Society of Neurology and the Asian and Oceanic Association of Neurology. The theme of WCN 2017 is “Defining the Future of Neurology.” The WCN will feature a series of programs and lectures led by leading scientists, clinicians, public health experts, and policymakers from around the world. Some of the cutting-edge topics will include gene therapy, stem/iPS cell medicine, brain-machine interface, and robotics in medicine. Traditional topics of neurology and neuroscience also will be presented. I encourage all of our readers to consider attending the meeting. Detailed information about XXIII WCN can be accessed at www.2017.wcn-neurology.com/. In our effort to inform readers of important and interesting developments in the journal, the editorial staff has selected two new “free-access” articles for our readership. This issue’s selected articles deal with cardiac transplantation in Friedreich’s ataxia (FRDA). Although ataxia is the clinical hallmark of FRDA, cardiac disease is the leading cause of death. There is no known cure for the cardiomyopathy of FRDA, and its course is independent of the neurological manifestations. For these reasons, a few patients with FRDA and severe cardiomyopathy have undergone cardiac transplantation. The results have been generally positive. Ashley McCormick and colleagues describe their experience and long-term follow-up of three patients with FRDA who underwent successful cardiac transplantation. Although each patient experienced progression of the neurological manifestations of FRDA, all maintained stable cardiac status several years post-transplant. The patients remain alive and socially engaged at five years, eight years, and 19 years post-transplant, respectively. The authors conclude that cardiac transplantation can be a reasonable treatment for patients with FRDA who develop end-stage cardiomyopathy. In an accompanying editorial, David Pleasure reaffirms that cardiac transplantation might be a viable option for selected patients with FRDA who have life-threatening cardiomyopathy. He points out that the transplanted hearts in these and other patients have shown no signs of cardiomyopathy, suggesting that the heart disease in FRDA is independent of its other manifestations. He also outlines potential future treatment interventions for the cardiomyopathy of patients with FRDA. David Pleasure, New hearts for Friedreich patients, J. Neurol. Sci. 375 (2017) 474-475. We are very pleased to introduce the March/April 2017 issue of World Neurology. Much of this issue revolves around the educational activities of the WFN, starting with the article by Wolfgang Grisold, MD, and Steven Lewis, MD, who provide an update on the many and varied educational activities of the WFN and its partners. This issue also includes enthusiastic and vivid reports from several African neurologists who were recent participantsin the Neurology Department Visit programs in Germany, Norway, and Turkey. We would like to add our sincere thanks here to our partner societies who make these WFN/partner society department visits so successful and fruitful for everyone involved. In his President’s Column, WFN President Raad Shakir, MD, provides a powerful proposition about the need for neurologists to work together, including educating the public, other providers, and our governments about the importance of brain health and systems of care delivery to combat brain diseases. We also report on the great honor recently bestowed on Vladimir Hachinski, MD, past president of the World Federation of Neurology, when he received the the Prince Mahidol Award in Public Health in Thailand. In his Editor-in-Chief’s Update from the Journal of the Neurological Sciences, the official journal of the WFN, John D. England, MD, describes his selected two new “free access” articles selected for the readership, which deal with the interesting issue of cardiac transplantation in Friedreich’s Ataxia. In this issue’s history column, Dr. Peter Koehler provides a wonderful synopsis of the many contributions of Charles-Edouard Brown-Séquard (on the bicentennial of his birth), including but certainly not limited to, his eponymous syndrome. Finally, Prof. G. Logroscino and his colleagues from Italy and France report on the recent International Course of Neuroepidemiology, Clinical Neurology, and Research Methods in Low-Income Countries that took place in Phnom Penh, Cambodia. An intensive five-day course on research methods, with a focus on practice in low- and medium-income countries, was presented Feb. 7-11 in Phnom Penh, Cambodia. The course was developed to help Cambodian neurologists establish clinical and population-based research programs on topics of utmost interest, including epilepsy, stroke, dementia, and infectious disease. “The International Course of Neuroepidemiology, Clinical Neurology, and Research Methods in Low-Income Countries” was organized by Prof. Giancarlo Logroscino, from the University of Bari; Prof. Pierre Marie Preux, Dr. Farid Boumédiene, and Prof. Benoît Marin, all from the University of Limoges; and Prof. Chan Samleng, president of the Cambodian Society of Neurology and chair of Neurology at the University of Health Sciences of Phnom Penh. The course was made possible through the support of a World Federation of Neurology (WFN) Grant in Aid 2015, and supplemented by grants from the University of Bari and the University of Limoges. Cambodia is experiencing a transition characterized by a rapid increase in life expectancy and of chronic diseases. In this context, neurology plays a major role within medicine but has to change perspective on education, clinics, and research. The course was held at the University of Health Sciences of Phnom Penh. The faculty were Prof. Logroscino, Prof. Marin, and Dr. Boumediene. It was attended by 14 of 16 members of the Cambodian Neurological Society (eight neurologists out of nine). Also attending were 14 students of the School of Medicine, selected by the faculty. The course faculty met with the dean of the University of the Health Sciences and the chair of medical affairs of the Calmette Hospital. Both praised WFN for its support and asked for the development of new courses on research and on new developments of specific sectors of clinical neurology. The chair of medical affairs expressed interest in a course developed specifically for the heads of the clinical departments to provide basic epidemiologic skills through a short seminar series. The general director of the Calmette Hospital also announced his goal to create a clinical research unit. The course was characterized by great enthusiasm and a high level of interaction between attendees and the faculty. Pre-course and post-course evaluations of the attendees’ skills in epidemiology were performed. Scores improved 4-10 points between the pre- and post-course evaluations. The course concluded with a discussion between the faculty and the neurologists of the Cambodian Neurological Society. Because two programs on the epidemiology of epilepsy are being presented by the Cambodian Neurological Society and the University of Limoges, discussion was focused on other diseases, particularly research prospects in the fields of stroke and dementia. An additional theme has been proposed for future courses: amyotrophic lateral sclerosis. This last area has been proposed because of the paucity of epidemiological and clinical data from Asian countries, with the exception of Japan. 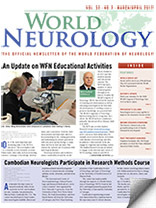 Prof. Samleng called for the Cambodian Neurological Society to collaborate with the WFN in the future. World Brain Day 2017 will be centered on stroke, and will be jointly prepared and celebrated with the World Stroke Organization. This topic emphasizes the importance of stroke and should alert towards prevention and introduce advances in treatment. We hope that many national societies will be able to join us again this year. Material for the campaign, as well as suggestions for press releases, will follow. World Brain Day 2017 will also have an international press conference centered on the important topic of stroke. For the status of ongoing preparation please follow our website and social media. Residents at Gazi University of Ankara. Many thanks to the Turkish Neurological Society and World Federation of Neurology (WFN) for allowing me to perform this visit to the neurology department of the Gazi University of Ankara from Nov. 15 to Dec. 15, 2016. My first day in Ankara was devoted to a visit to the city and the headquarters of the Turkish Neurology Society with Burak Tokdemir, manager of the Turkish Neurological Society. The next day was effectively my first day in the neurological department, with Tokdemir, where we first met Prof. Ayşe Bora Tokçaer, the head of the neurology department. After welcoming me, she give me my program, which began with a visit to different parts of the department with Dr. Serhat, a resident in neurology. Gazi University staff from left: Prof. Reha Kuruoglu, Prof. Ayşe Bora Tokçaer, Dr. Maouly Fall, Prof. Bulent Cengiz, Dr. Hale Zeynep Caglayan, Prof. Bijen Nazliel, and Prof. Yahya Karaman. We went to the offices of different professors and associate professors, the outpatient clinic, the inpatient clinic with the intensive unit care, and the EEG and EMG laboratories. 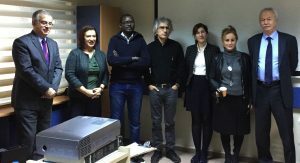 During my visit to the neurology department of Gazi University, I attended several activities, which were important for me and for my practice in Senegal. I participated in the activities of the EMG laboratory observing the basic techniques of nerve conduction, needle EMG with several muscles, which I never seen evaluated before, and single-fiber EMG, which is not available in Senegal. Also, I went to both a standard EEG laboratory and to long-term monitoring video EEG and interpretation, where I acquired many experiences. In the EMG laboratory with the EMG team. I spent each week in the outpatient clinic with different specialties to learn and perform several situations in clinical neurology: headache disorders management, neuromuscular diseases, epilepsy management, multiple sclerosis, Parkinson’s diseases and other movement disorders, and neuro-ophthalmological diseases. I saw many cases of epilepsy, movement disorders, headache, MS, pseudotumor cerebri, as well as many videos and photos. I also participated in some sessions of botulinum toxin injections and apomorphine test, which are not available in Senegal. These activities were helpful and useful to me because since I returned to Senegal my approach and management of patients have improved considerably. In the EEG laboratory with the EEG team. I also spent two days of the week in the intensive care unit and inpatient area to see how to manage some rare neurological disorders and emergency cases. My best experience was the morning of Dec. 7, when I joined the neurosurgery team of Prof. Ayşe Bora Tokçaer and Prof. Tylan Altiparmak to see the operation on a female patient with generalized dystonia. She was operated on for globus pallidus interna DBS. During the operation, I saw how they target the globus pallidus (GPi) and microrecording. I was lucky to attend this surgery session all the more because it was something I had only read about before. It was a great experience. I also had the opportunity to visit the school of physiotherapy and rehabilitation and talk with physicians about the management of patients in the outpatient and inpatient clinics. During the last day of my visit, I was invited to talk about neurology in Senegal. I talked about my country, the academic neurological team, the different hospitals and their specialities, the neurological diseases in our setting, how neurology is being practiced, which neurological disorders are common and how we manage them, and with what means. The audience was attentive, and the discussion after was essential. My experience during this visit was well above my expectations and gave me a broader understanding of the management of neurological disease in our conditions of work in Senegal. It was my great pleasure to be accepted for a department visit at University Hospital Ulm in Germany. I arrived there on Oct. 3, 2016. I started the next day in the neurology department. Prof. Kasubek, who is the vice head of department, introduced me and showed me around the neurological department. For three weeks, I stayed in the emergency room. It was an opportunity for me to see how they receive patients and how they manage them. When the emergency room was empty, I had the opportunity to assist senior physicians in the stroke unit. I also spent time visiting hospitalized patients. During my time there, I assisted in a thrombectomy procedure with a radiologist. It was a wonderful and interesting experience. I spent my last week there in the neuro-inflammatory part of the neurology department. I discovered many things there, such as immunoadsorption, plasmapheresis, and immunoglobulin administration. Every time a patient was examined by a German physician, I received a translation in English. I asked questions and received responses. My stay was enjoyable, and I was happy to discover another way to practice medicine. At the end of my stay, I realized that there was great benefit for me to discover the German neurological model. From Oct. 22 to Nov. 19, 2016, we had a study trip in Oslo. We arrived on Saturday, Oct. 22, and stayed in the researcher house in Blindern. It was a comfortable house with all of the amenities, located between Riks Hospital and Ullevål Hospital. We spent the first two weeks at Riks Hospital, the third week at Ullevål Hospital, and the last week at the National Epilepsy Center. At Riks Hospital, we met Prof. Espen Dietrich and all of the teaching staff of the neurology department. We participated in morning staff meetings at the neurology ward and at the radiology ward, where we learned a lot about neuroradiology. We also visited patients. At the clinical ward, we participated in the consultation of movement disorders with Prof. Inger Marie Skogseid, whose patients had severe dystonia and Parkinson’s disease. Some of them had deep brain stimulation (DBS), and others received botulinum toxin injections. It was the first time we saw patients who had DBS and botulinum toxin for movement disorders. We attended headache consultation and neurovascular disease consultation with Prof. Anne Hege Aamodt. We saw patients with vascular disease (classical stroke) as well as a rare case of middle cerebral artery vasospasm in a young woman. With Prof. Aamodt, we attended headache consultations and saw patients with migraines and occipital headaches. We also witnessed the administration of botulinum toxin and local anaesthetic injections for headaches. Even if sometimes such cases are found in our daily practice, the management (exploration and treatment) is totally different. The main fact we learned is to use alternative treatment, such as botulinum toxin or local anaesthetic injection, for the treatment of headache and movement disorders. We also had a great interest in attending neurophysiology interventions. We performed EEGs and EMGs, and we had really interesting cases, including diabetic amyotrophy and severe peripheral polyneuropathies of different etiologies. The third week, we visited Ullevål Hospital, where the daily routine is different from Riks Hospital; indeed it’s mostly an emergency hospital. We met Prof. Sigrud Kierulf Braekken and her team. We witnessed some cases of refractory epilepsy, myasthenia gravis, and trigeminal neuralgia at the emergency unit, but no cases of acute stroke and thrombolysis. We also met Dr. Angelina Maniaol, whose principal interest is myasthenia gravis, and discussed juvenile myasthenia gravis, which is one of our main research subjects. The last week, we visited the National Epilepsy Center, a really amazing experience. We met Prof. Rune Markhus and Prof. Ellen Molteberg, and their teams. We had some rich exchanges about research topics we could do together. We discussed research methodology with Prof. Morten Lossius and Prof. Cecilie Johanssen Landmark. At the morning staff meeting, we discussed polysomnography recordings in a patient with a parasomnia; we read and discussed EEG recordings of children with epilepsy. With Prof. Anette Ramm Pettersen, we also exchanged information about neurophysiology and neuropsychological comorbidities in children with epilepsy. We shared our daily experience in Senegal through two talks: “Neurology in Senegal” and “Two Clinical Cases of Tropical Neurology.” The first one was about a stroke in a patient with HIV-1 and HIV-2 co-infection, and the second case was about Pott’s disease in an HIV-1 patient. We attended a meeting on deep brain stimulation at the congress center with Prof. Skogseid, organized by the Norwegian Neurological Association. We focused on movement disorders, neurophysiology and epileptology, and myasthenia gravis because those topics are our main interests. On the social part of the stay, we visited Oslo with Prof. Geir Slapø and his wife. 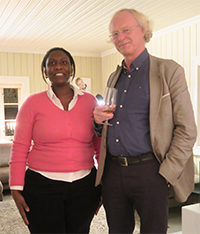 We had a social evening at Prof. Aamodt’s House, where we met the members of the Norwegian Neurological Association. We saw snow for the first time, and all of this made our trip unforgettable. We acknowledge all of the members of the Norwegian Neurological Association and the WFN for having made this trip possible. 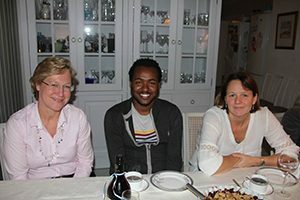 Yohannes Debebe Gelan, MD, (center) together with the chairman of the Norwegian Brain Council and the chief physician at Oslo University Hospital during a social event. I am Yohannes D. Gelan, a final-year neurology resident at Addis Ababa University, Ethiopia, at the time of the visit. I was very lucky to be selected to the prestigious WFN Department Visit program. I knew ahead of my visit that I would have a once-in-a-lifetime experience in Oslo. I visited the neurology units of Oslo University Hospitals (OUH) with a fellow African neurologist from Senegal named Marième Diop Sene. My visit surpassed all my expectations. I was thrilled by the amount of attention and respect I received from the people I met in OUH. The visit took place from Oct. 21 to Nov. 18, 2016. The first person I met in Oslo was Prof. Kari Anne Bjørnarå who took care of everything that I needed to survive the first few days in cold Oslo. On Saturday, Oct. 22, we toured the beautiful city of Oslo with Prof. Geir Slapø and his wife, Prof. Andrea Slapø. They were very welcoming. They took us to the Holmenkollbakken. I can’t imagine how people are brave enough to do skiing from that height. I rode on the zipline, which was fun. We spent the first two weeks in Rikshospitalet, which is a highly specialized national referral center for Norway. We were introduced by Prof. Anne Hege Aamodt and Prof. Espen Dietrichs to all of the staffs of the OUH neurology department on the first day in their morning meeting. We were quite surprised that the method of communication was changed to English not only for the first days but also for most of the month we stayed with the department. The majority of the patients also were willing to speak to us in English. That helped to make my visit productive. I was a little bit scared when we were asked to do a mandatory methicillin-resistant Staphylococcus aureus (MRSA) test before getting access to the wards. We were told that Norway has the lowest MRSA prevalence rate. Fortunately, the tests were negative, and we were given keys, IDs, and all the other things required to wander around the hospital. A typical day in OUH starts with a morning meeting followed by radiology sessions. I was impressed by the level of communication between radiologists and neurologists. I have taken a lesson on the importance of working in tandem with radiologists for all neurologists. I hope we will start a similar system in our department as well. There were short presentations on Monday morning and Tuesday at lunch time. The first week, I followed Prof. Aamodt in the vascular neurology and headache units. She was enthusiastic to show me everything despite her busy schedule at both the stroke and the headache units. I saw patients with rare causes of stroke. I observed how extracranial and transcranial Doppler ultrasound is useful in the evaluation of patients with acute stroke. Even though I wasn’t lucky enough to watch a thrombectomy being done, I saw how it may bring dramatic changes in a patient with vertebral artery thrombosis. I also witnessed occipital and supraorbital nerve blocks while Prof. Aamodt was working with her headache patients. On the second week, I joined the movement disorder team. Prof. Inger Marie Skogseid showed us two cases of Wilson’s Disease and many more interesting cases. I was able to accompany her to the operating room when she was called to adjust the intraoperative deep brain stimulation (DBS) current setup for a patient with essential tremor. She also shared with us her vast experience on the use of DBS in dystonic patients. I also saw botulinium toxin injections for various movement disorders and chronic pain disorders. At the end of the second week, I visited the electrophysiology unit. Apart from the routine nerve conduction studies and EMG, I was able to observe quantitative sensory testing for the first time in my clinical experience. During the third week, we went to Ullevål Hospital, which is the center for most of the neurological emergencies for the Oslo region. They also have a specialized center for multiple sclerosis. We were introduced by Prof. Sigrun Kierulf Braekken, the head of the neurology unit. The neurology staff in Ullevål hospital also made English their primary method of communication for us. The first days in Ullevål hospital were a bit difficult as the hospital architecture was so complicated, unlike the Rikshospitalet. I accompanied neurologists on the general neurology ward, and I observed the sophisticated care delivered at the center. It was interesting to see the long list of tests that are done from CSF samples. On the second day, I accompanied the neurologist in the emergency room. It was fascinating to see how the emergency multidisciplinary team works with such coherence and speed. The infrastructure and the equipment in the ER are quite astonishing. I had a chance to visit the stroke unit and neurology ICU. I attended the neurological physical examination session on the third day of my stay in Ullevål hospital. It was good to see how the basics are done even in the high-tech setup. Finally, I joined the electrophysiology unit, and I got a great lesson in EEG interpretation from an electrophysiology fellow. On the last week of my stay, I visited the Sunnaas Rehabilitation Hospital. The hospital is built on the hillside with an amazing view of the fjords. Prof. Frank Becker briefed me on the hospital. It is the highest rehabilitation center for Norway. It was interesting to hear about their experience with lifelong rehabilitation follow-up of some neurologic disorders. It is also a national center for locked-in-patients and rare neuromuscular disorders. I attended case discussions held between Prof. Tor Haugstad, the head of traumatic brain injury rehabilitation, and his colleague. Afterward, he showed me around the individual patients’ rooms, the gymnasium, the swimming pool, and the workshop for occupational rehabilitation. The meticulousness of their approach in rehabilitation of patients is something I should dream of establishing in my home country. At last, I went to visit Spesialsykehuset for Epilepsy (SSE). Prof. Ellen Molteberg showed us around the adult and pediatric wards, epilepsy monitoring unit, the center for mentally handicapped children, and the special school for children and adolescents with epilepsy. I visited the kitchen for ketogenic diet preparation. I also was able to observe when ambulatory EEG is applied and the results are read. I learned a lot from morning discussions on peculiar EEGs on new admissions. We were really impressed by the clinical work as well as by the dedication for research activities in epilepsy. Prof. Cecilie Landmark showed us the sophisticated antiepileptic pharmacologic laboratory. She also briefed us about ongoing trials in their laboratory.